Part of the La Trobes buildings on Bow Street, next to the Post Office on Harbour Board leasehold land, the building contained Margaret Baker's store, Fuller's tearooms, and a barber's shop. Harry Salmon had a boot repair business here in the 1920's. 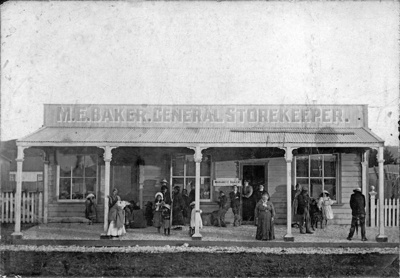 The store burnt down about 1930 along with Bert Gleeson's fruit shop.